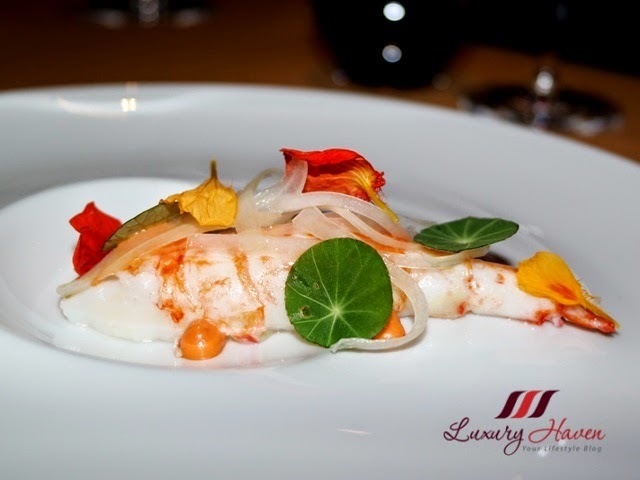 Offering an original interpretation of traditional Italian cuisine, my dinner commenced with a bottle of the Azienda Agricola Guccione Perricone Arturo di Lanzeria 2006 from Sicily, and line-up of pretty Amuse Bouche before the actual meal kicked off. 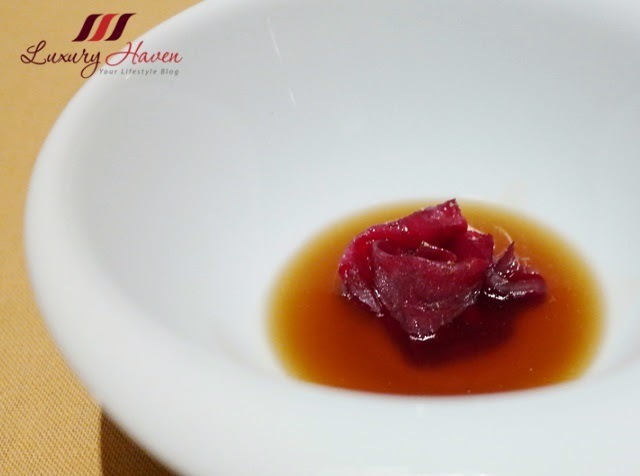 I was fascinated the moment my first course arrived at my table - Bollito Misto Verdura ( ボッリート ミスト 野菜 ). Bollito Misto is a classic northern Italian stew with meat gently simmered for couple of hours in an aromatic vegetable broth. The broth can then be used as a base for soups and risottos. 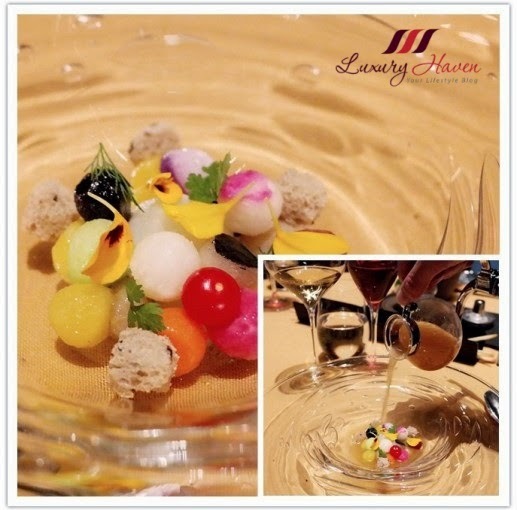 The charming Consommé Vegetable consists of colourful mini balls made up of potatoes, carrots, radish, tomatoes etc. The cameriere then poured the piping pot of broth into the plate of vegetables. Gosh, the rich and fragrant consommé was such a pretty and delectable treat bursting with flavours. 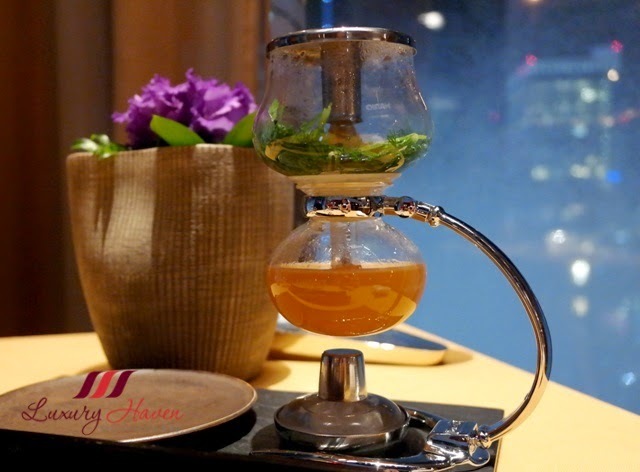 Gamberi Erbe ( 海老ハーブ ), a sweet and juicy shrimp infused with herbs that's full of aroma. Chitarra Funghi ( キタッラキノコ ) is a pasta dish typical of Abruzzo, Italy. Chitarra or Guitar, is a frame strung with music wire that is used to cut fresh pasta into strands. 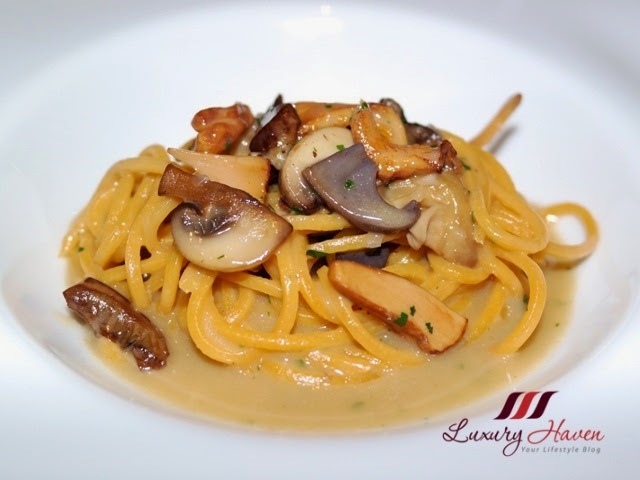 The tasty and velvety spaghetti, enveloped in slices of mushrooms, was exploding with the tangy creamy funghi sauce in my mouth. The original dinner menu calls for Risotto Mussels, but guests have an option to change it to Risotto Truffles with an addition of ¥8,000 (approx USD 70). The word " truffles " is enough to make me weak, and I was all for it! I was happily seated, waiting patiently as the cameriere shaved the White Truffles onto my plate of Italian rice. Kinki Rapa ( キンキカブ ) is actually Turnip dish. Nothing to shout about, it tasted like some preserved turnip served in an appetizing broth. I was already getting full by this time, but the succulent Manzo Mozzarella ( 国産牛モッツァレッラ ) was almost irresistible. Thankfully, it was just a small piece of beef, and I could joyfully savour the full flavour of the luscious mini steak. A refreshing sorbet pre-dessert was served before I was presented with an exquisite plating of the Castagna Cioccolato ( 栗 チョコレート ), a Chestnut Chocolate dessert. Well, the evening ended with a sweet birthday treat, another wonderful birthday celebration in Tokyo last November. Dinner Menu ¥22,000 + ¥8,000 to change to Risotto Truffles. 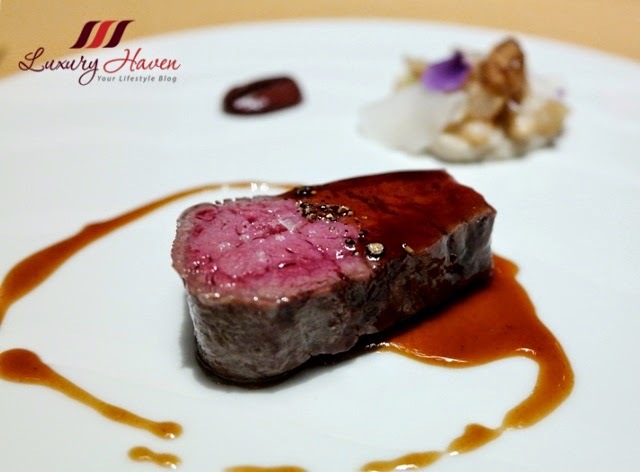 Have you been to any Michelin-starred restaurants? Are you a fan of Bulgari? Ever stepped into the Bulgari Ginza Tower, hosting the largest Bulgari store in the world with 940 square meters of floor space where you can dine and shop in the same building? Do you own a Bulgari B. Zero1 Watch too? You look stunning in your dress. The food here is really an art itself. 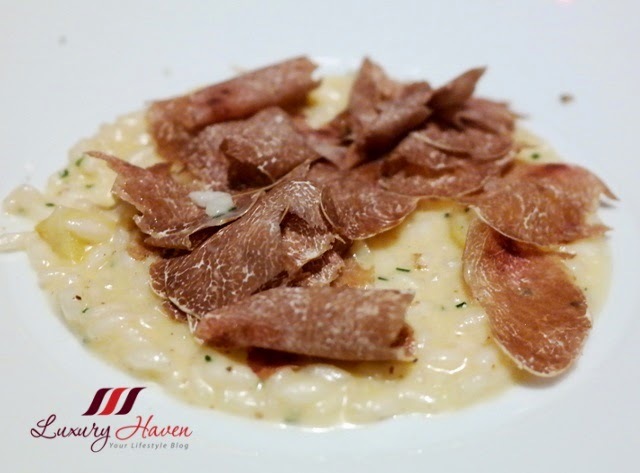 How would you describe the taste of white truffles? Mun, I love truffles for their earthy and musky aroma, & the difference between white and black truffles is actually quite subtle. I never had an opportunity to eat in one of Bulgari's restaurants but the food you were served certainly looks delicious. Your outfit is very elegant and feminine! perfect birthday look<3 You mention birthday treats, was it your birthday that day? Yap, I'm a Nov kid, Ivana! 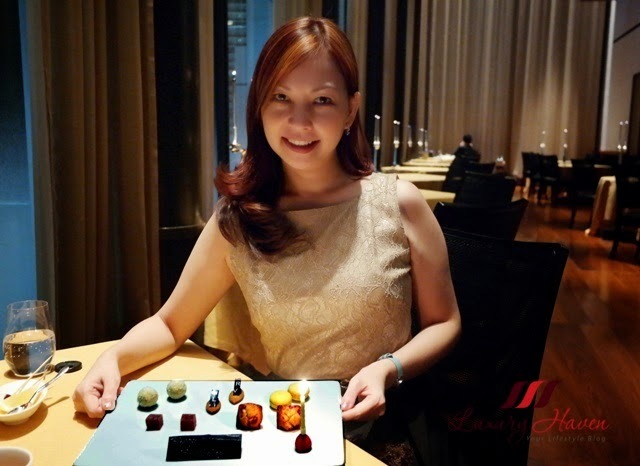 So glad to have a celebration at Bulgari, Thanks for the lovely note, dear! Such an elegance place to dine in the food looks amazing. I always love your food review. 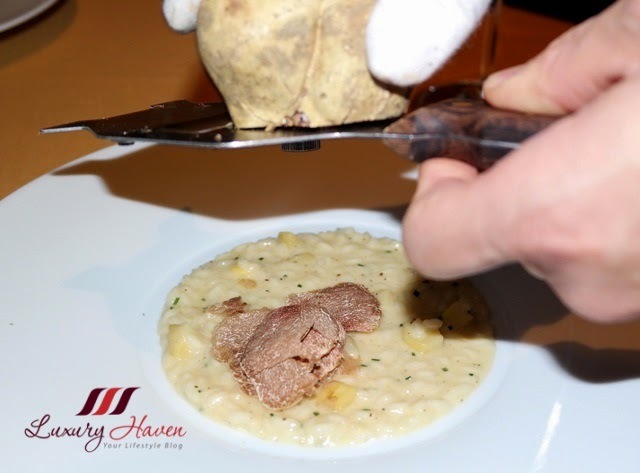 Elegant place and delicious food, i love risotto!!! I am a huge fan of Bulgari and fancy places! Hello Shirley! How are things?! Hey Alvin, what a surprise! Glad this caught your attention. Bulgari watch giveaway? I wish too! Hahaha! Sharlynn, it's ok not to invest in luxury watches......... you'll get to inherit them anyway. Hahaha! 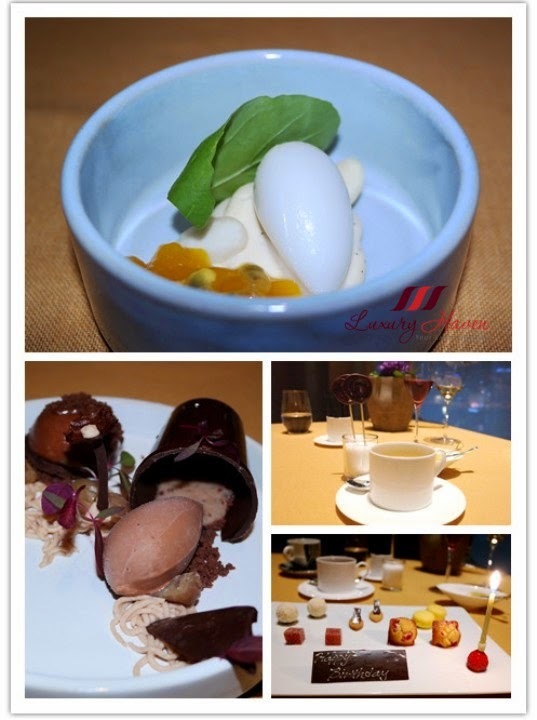 How lucky you are to dine in such an elegant restaurant, thank you for sharing with us! I am a Bulgari fan. Love your lovely elegant dress, Shirley. You looked stunning. What an amazing way to enjoy Italian food. The restaurant is classy and equally classy is the presentation of the dishes. 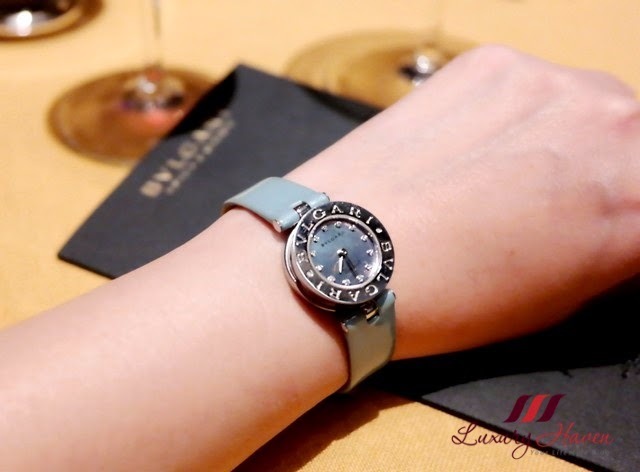 Bulgari watches? I can only see but I don't think I can afford to buy. Oh god, everything looks so tasty! That broth looks amazing. Lovely place. You look gorgeous as usual. Here in Mi,sn there is Bulgari hotel and the restaurant is absolutely top! Amazing pictures and delicious food! Amazing place, I really love Tartufo! I was contemplating a snack before I dropped by for a visit, Shirley. Well, looks like it's a good thing I waited. I'm stuffed just looking at all this artful food. Just perfect and what ambience! You of course are the Pièce de résistance in that lovely dress. What a fun experience! You look wonderful as always!!! Yummy food. 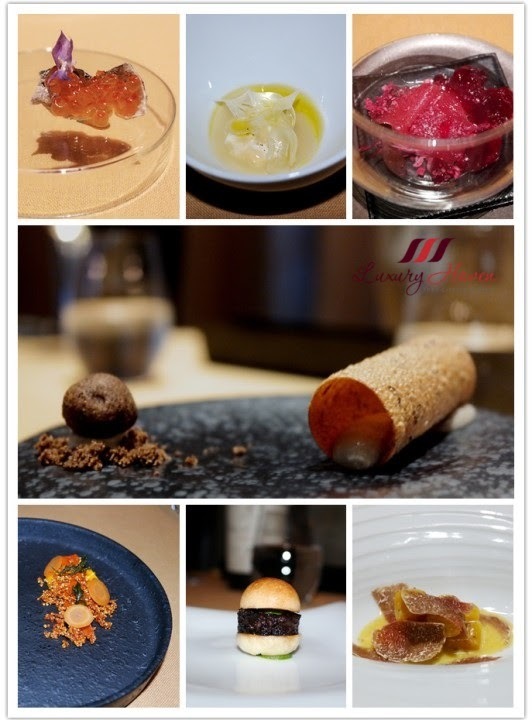 You visit the most amazing restaurants!! The food looks delicious and you look gorgeous! 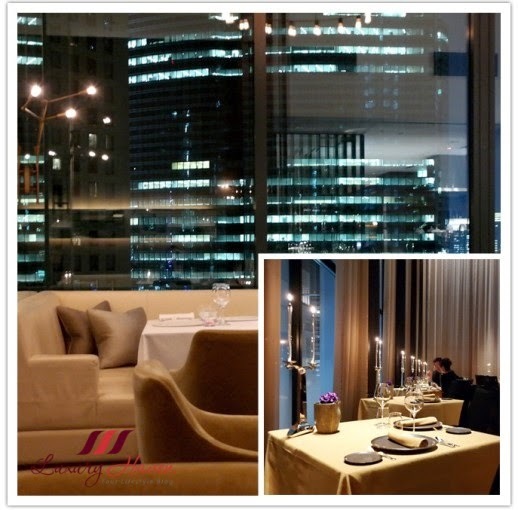 I have seen the Bulgari store in Ginza, but didnt know there ws a restaurant at the top! Wish I had known it then! What a pretty line up! Amazing restaurant. The food looks delicious too. Have a wonderful week! omg all dishes look amazing! It's amazing that Bulgari actually has a restaurant. What a wonderful treat for you Shirley! Everything looks delicious and beautifully presented. Awesome place and you look stunning. That looks amazing! I never knew Bulgari had a restaurant. Now to convince hubs to take me to Japan! Hello love, just popped in to say hi! wow this is the real Bulgari restaurant! i reeally thought that this is only a replicate name of that brand!